With the increasing use of Internet and the Web, cyber criminals have become more active than ever. Computer security has become the biggest security concern these days. Numerous scam and fraud schemes are being directed toward public Internet users. People are so consumed by the smartphones and Internet that they fail to realize the serious repercussions of their addiction. Computer technology has been growing at an unprecedented rate and security preparedness has not been up to the mark to go with the current growth. This is because almost everyone with a smartphone can access the Internet. Even children are allowed to access the Web at an early age at schools and at home. Handheld devices with network access are now easily available to everyone. This gives rise to a myriad of security issues. Corporate, government, and education system is equally affected by these never-ending security issues such as identity theft, data breach, data integrity, confidentiality, and so on. There are numerous issues concerning computer security and the electronic commerce environment. One of the most pressing issues today is computer virus which are almost everywhere. This is where antivirus programs come to the picture. Antivirus, as the name suggests, are so designed and developed to detect and eliminate computer viruses. However, with the proliferation of other kinds of threats such as malware, spamware, antivirus software programs started to provide protection from other computer threats. Norton and McAfee are two of the most recognized names in the computer security industry that sell antivirus programs. Norton is one of the most popular and widely used antivirus and antimalware software developed by Symantec Corporation. It is one of the prominent names in the computer security business, when it comes to keeping your computer safe and secure from all kinds of viruses and online threats. Norton has a large customer base to potentially report new viruses to them so that they can update their software programs accordingly. As new threats emerge, Norton keeps on updating its antivirus programs to find and stop potential malware and other security threats. Symantec is one of the world’s largest endpoint security vendors, providing security to millions of devices on both personal and corporate networks around the world. Norton Security is arguably the undisputed king of computer security that provides the best protection for your computer, smartphones, and other mobile devices. McAfee is a California-based global computer security software company that provides complete computer security solutions to protect your computers, networks and cloud from all kinds of viruses, malware and other security threats. It provides complete security solutions to both consumers and business organizations. It is a powerful yet simple to use antivirus software that provides security against all kinds of threats. It also provides periodic security updates to quickly detect, analyze, and eliminate ore advanced threats. It provides endpoint protection for targeted attacks and to provide ultimate security solutions across multiple devices and operating systems. McAfee has built a global threat intelligence network over the past three decades gathering data on security threats from millions of endpoints across the globe. One of the most important factors to consider when choosing the right antivirus software is security. Both are the most popular and widely used names in the computer security business and both the companies are equally equipped and qualified to protect your computers from all kinds of threats. McAfee is better equipped with more security-related features and extra utilities to provide complete security solutions to consumers and businesses alike. Norton excels in firewall protection, privacy protection, anti-spam protection, virus removal, and much more. Norton is the clear winner when it comes to efficiency and protection. One of the key distinction points and deciding factors when choosing between Norton and McAfee is to factor in process consumption meaning which one’s better in terms of consuming system resources. Norton may not be the fastest but it’s definitely a lightweight antivirus program and security tool which has a very less effect on the performance of your computer. The memory usage of Norton is also quite impressive because it keeps flushing its memory to keep the usage at a low level. McAfee, on the other hand, is not as memory efficient as Norton, which makes it the clear winner. Norton’s suite of antivirus programs and security tools are relatively cheaper than that of McAfee’s; in fact, the cost of Norton antivirus software suite is comparatively lower than most other antivirus software programs. Both the security companies provide at least three levels of security products – a standalone antivirus, an entry-level antivirus suite, and a more advanced security suite with advanced features and security tools. Norton Internet Security is cheaper than McAfee Internet Security. Norton security starts with the Basic which costs $50 a year and goes all the way up to Norton Security Premium which costs $110 per year. While Norton and McAfee both are two of the most recognized names in the computer security business with a well-established customer base, choosing the right software between the two is a little difficult, especially with both of them offering an extensive set of features to better protect your computers from security threats. If you wish to go beyond the basic antivirus protection, then McAfee’s security suite is the logical solution for you, thanks to its complete security solutions and advanced protection-related features. However, Norton excels in internet security and provides all-around protection from all kinds of malware threats with utmost accuracy and it’s cheaper than McAfee. Sagar Khillar. 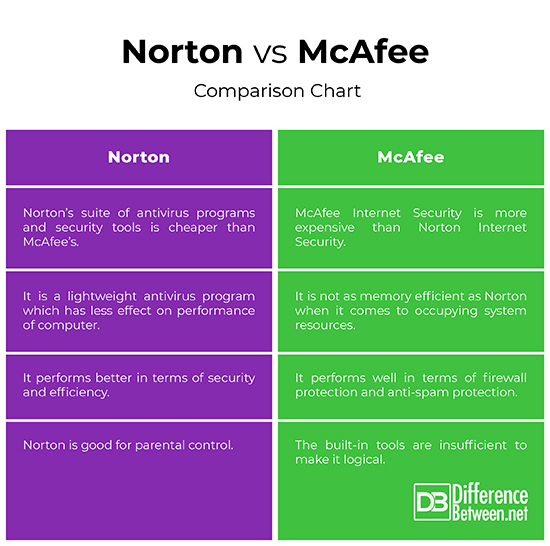 "Difference Between Norton and McAfee." DifferenceBetween.net. April 4, 2019 < http://www.differencebetween.net/technology/difference-between-norton-and-mcafee/ >.